Faos Luxury Apartments are located in Agia Efimia, a picturesque bay within the beautiful Pylaros Valley region. Just 3 min walk from the beach, a wide selection of restaurants, cafes, mini markets, souvenir shops, boat and car rental, daily cruises and many more. 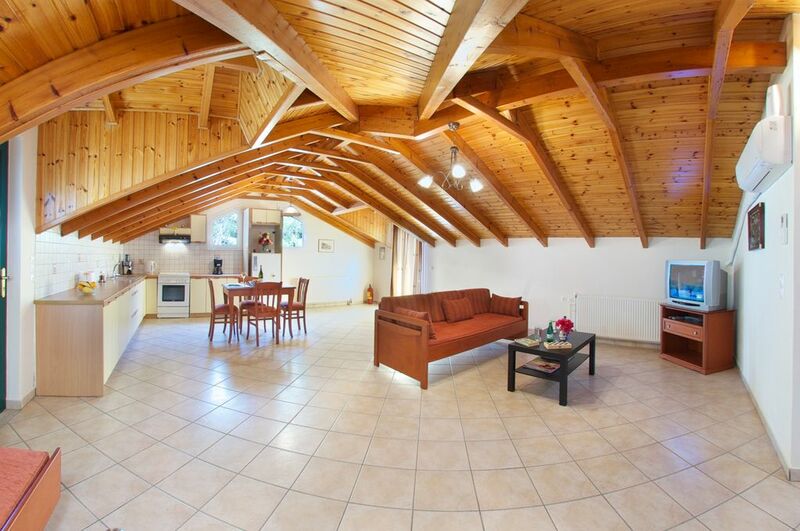 The property consists of a 3d floor attic 2 bedroom apartment for up to 5 guests. Faos Apartments offer self-catered accommodation with balcony overlooking Pylaros valley and Agia Efimia bay. The apartment has a fully equipped kitchen and spacious living room with dining table, relaxing coaches. Each unit comes with a satellite TV, CD player and washing machine as well as air condition. Due to its central position is ideal for guests wanting to explore Kefalonia from north to south, approx. 30 km from cosmopolitan Fiskardo (north) and the capital Argostoli (south), Poros (east) and Lixouri (west). On your arrival you will be welcomed by Apostolos, the owner, who will be very glad to give you all the required information, assist you to organize your trip and help you with anything you may need during your stay. Included in the price is an every day maid service (tiding, taking rubbish out of the bins and sweeping the floor, as well as changing towels and linen every 4 days. A complimentary welcome basket will be offered on your arrival. In order to make your stay more enjoyable we can offer you the option to order any other goods in advance, you can do that by mail, so you can start your holiday the moment you arrive! (payment will be done on cash providing receipt upon arrival). All apartments are centrally heated. Smoking is permitted only on the outside areas. Thank you very much for your nice comments,it was indeed a pleasure to accommodate for you and your nice family.Looking forward to seeing you again. Our stay here in Agia Efima was perfect! The apartment was very well appointed with everything we needed. Plenty of excellent tavernas were a short walk away as well as shops, boat hire and small beaches. Parking was easy, with plenty of space outside and our location was ideal for exploring the island. Apostolos was very helpful in guiding us in our days out, giving us valuable local knowledge to ensure that we saw everything Kefalonia has to offer. We would highly recommend. Many thanks for taking the time to write this review.It is very much appreciated.You have been very kind and pleasant people. From the moment that Apostolos met us at the airport, until the moment we said goodbye, the holiday felt as if we were staying with a very good friend rather than renting an apartment. Nothing was too much trouble for him. We saw far more of the island than we would have done without his help. The apartment was exceptionally well equipped, with washing machine, coffee maker, toaster, iron and ironing board, TV and air con. The room was serviced daily and was kept immaculately clean. Thank you very much for taking time to write thiw review.It is very much appreciated.You have been very kind and pleasant peope.You are always welcome! Beautiful location with amazing views. Spacious apartment. Very nice,friendly and polite guests,perfect communication, they have complied with all the rules of the house and left the apartment clean and everything in order.We hope to see they again.Thank you very much!Absolutely we recommend. Apostolos was a great owner, very helpful and informative, the apartment was cleaned everyday and was spotless. The location is excellent, not just for Agia Efemia but also for touring the island. We would not hesitate to recommend this apartment. A beautiful peaceful apartment with an exquisite view. My brother and myself spent ten day's at the apartment from the fifth of September 2016. Apostolos the manager of the apartment collected us from the airport and made us very welcome,there was a some basic there for us which was helpful as we arrived late. Apostolos was not only our taxi driver but our guide ,he would recommend beaches, places of interest and the best places to eat. The property was in immaculate condition and i have already recommended it to friends and family.I will be returning. Within 3 min walk you can find a wide selection of good tavernas, cafes, mini markets, bakeries, pastry shop, boat hire, pharmacy, diving centre, car and moppet rental, newsagent, hair dresser, ATM and post office. Faos Luxury Apartments are less than 10km away from most of the best attractions and beaches of the island, like the port of Sami and Antisamos beach, famous Myrtos beach, unique Melissani Lake and Drogarati Cave, Themata Monastery. Due to its central position is ideal for guests wanting to explore Kefalonia from north to south, and around 30 km from cosmopolitan Fiskardo (north) and the capital Argostoli (south), Poros (east) and Lixouri (west). Kefalonia International Airport is at 38 km.